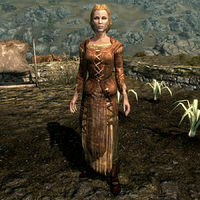 Alfhild Battle-Born is a Nord farmer and a member of Clan Battle-Born living in Whiterun. Jon Battle-Born is her brother, and her parents are Olfrid and Bergritte. She is married to Idolaf, with whom she has a son, Lars. She maintains Battle-Born Farm outside Whiterun and will buy leeks, wheat, and gourds for a harvesting job well done. At 6am, she goes to the Temple of Kynareth, and then goes to the farm at 10am. She stays there until 8pm when she goes home, and goes to sleep at midnight. On Tirdas and Turdas, she goes to listen to Heimskr's ramblings at 3pm. Alfhid wears a set of farm clothes and a pair of boots, and is equipped with an iron dagger. She carries a key to the House of Clan Battle-Born, a key to Battle-Born Farm, and a selection of common loot and gold. When approached, she will often comment on the ongoing feud between the Battle-Born and Gray-Mane clans but takes a different view of the feud than her husband and father, saying, "This war's as stupid as our feud with Clan Gray-Mane." and "Need something? Unlike the rest of my family, I've got work to do." She may also reveal that her son Lars often gets bullied: "My boy Lars has been getting beat senseless, and by a girl, no less!" She will also tell you about her brother Jon's interests: "My brother Jon's got the right of it - join the Bards College and avoid this pointless war." She will add, "Too bad he died before he had the chance." if Jon is dead. She exits conversation with either "I'll see you." or "It's back to work, then." Alfhild: "So, what book should I read to you tonight?" Bergritte: "How about 'The Lusty Argonian Maid'?" Bergritte: "You've got no sense of humor, you know that? Why don't you pick up where you left off with 'The Real Barenziah'." This page was last modified on 22 October 2017, at 21:46.